A tax inversion is when a corporation restructures itself so that the current parent is replaced by a foreign parent, and the original parent company becomes a subsidiary of the foreign parent; thus moving its tax residence to the foreign country. Executives and operational headquarters can stay in the original country. The US definition requires that the original shareholders remain a majority control of the post-inverted company. Annual number of US corporate tax inversions (1983–2016). Source: Federal Reserve Bank of St. Louis. The overwhelming majority of the less than 100 tax inversions recorded since 1993 have been of US corporations (85 inversions), seeking to reduce their exposure to the US corporate tax system. The only other jurisdiction to experience a material outflow of tax inversions was the United Kingdom from 2007–10 (22 inversions), however, UK inversions largely ceased post the reform of the UK corporate tax code from 2009–12. Assets of completed and aborted US inversions (1994–2015). Source: Congressional Budget Office. The first inversion was McDermott International in 1983. [a] Reforms by US Congress in 2004 halted "naked inversions", however, the size of individual "merger inversions" grew dramatically; in 2014 alone, they exceeded the cumulative value of all inversions since 1983. New Treasury rules in 2014–16 blocked several inversions, and the Tax Cuts and Jobs Act of 2017 (TCJA) reduced the incentives of inversions. As of March 2019[update], there has no material inversions post-2017. As of March 2019[update] the most popular destination in history for US corporate tax inversions is Ireland (with 22 inversions); Ireland was also the most popular destination for UK inversions. The largest completed corporate tax inversion in history was the US$48 billion merger of Medtronic with Covidien plc in Ireland in 2015 (the vast majority of their merged revenues are still from the US). The largest aborted tax inversion was the US$160 billion merger of Pfizer with Allergan plc in Ireland in 2016. The largest hybrid-intellectual property (IP) tax inversion, was the US$300 billion acquisition of Apple Inc.'s IP by Apple Ireland in 2015. 1983. [a] The first officially recognized US corporate tax inversion was of McDermott International from Texas to Panama. 1990. The relocation of Flextronics from California to Singapore; however it is not considered as a full tax inversion. 1994. The second officially recognized US corporate tax inversion was of Helen of Troy Limited from Texas to Bermuda. 1996–2004. The first major wave of US tax inversions mainly to Caribbean tax havens such as Bermuda and Cayman Islands; these inversions were mostly "naked inversions" where the corporate re-domiciled to a tax haven in which they had no existing business, and included: Ingersoll-Rand, Accenture, Seagate, Cooper, and Tyco. 2004. US Congress passes the American Jobs Creation Act of 2004 (AJCA) with IRS Section 7874 that requires existing shareholders to own less than 80% of the new entity, and introduces a "substantial business activities" test in the new foreign location; AJCA ends "naked inversions" to Caribbean-type tax havens. 2009–2012. Several US inversions from the first wave to the Caribbean-type tax havens relocate to OECD tax havens, such as Ireland (Ingersoll-Rand, Accenture, Seagate, Cooper, and Tyco), and Switzerland (Weatherford and Noble), fearing a backlash from a new Democratic administration. 2012–2016. The second major wave of US tax inversions who use mergers to meet the "substantial business activities" of IRS 7874; Ireland and the UK are the main destinations and the scale and size of these inversions are significantly larger than the first wave (see graphic), and included: Medtronic, Liberty Global, Eaton Corporation, Johnson Controls, and Perrigo. 2012. The US Treasury issues T.D. 9592 increasing the "substantial business activities" threashold in the foreign destination from 10% to over 25%. 2014. The value of new proposed US tax inversions in 2014 alone (US$319 billion) exceeds the cumulative value of all previous US tax inversions in history. 2014. The US Treasury further tightens the regulations around the existing ACJA/TD 9592 threasholds; AbbVie cancels a US$54 billion inversion to Ireland with Shire plc. 2015. Medtronic completes the largest tax inversion in history in a US$48 billion merger with Covidien plc in Ireland. 2015. Apple Inc. completes the largest hybrid IP-inversion in history by moving US$300 billion of IP to Ireland (see leprechaun economics). 2016. The US Treasury tightens, and introduces new regulations around the existing ACJA/T.D. 9592 thresholds which blocks the US$160 billion merger of Pfizer with Allergan plc in Ireland. 2017. The US Congressional Budget Office forecasts a 2.5% (or US$12 billion) permanent reduction in annual US corporate tax revenues from inversions. 2017. The US Tax Cuts and Jobs Act reforms US tax code and introduces a lower 21% headline tax rate and moves to a hybrid–"territorial tax system". 2007–2010. The United Kingdom loses a wave of tax inversions mainly to Ireland including: Experian plc, WPP plc, United Business Media plc, Henderson Group plc, Shire plc, and Charter International. 2009–2012. The United Kingdom reforms its corporate tax code introducing a lower 19% corporate tax rate and moves to a full "territorial tax system". 2013. Liberty Global completes the second largest US tax inversion in history in a US$24 billion merger with Virgin Media in the UK. 2015. The UK HMRC reports many UK inversions to Ireland returned (e.g. WPP plc, United Business Media plc, Henderson Group plc); and that the UK was a major destination for US inversions. 2016. The UK becomes the third most popular destination in history for US tax inversions with 11 inversions (Ireland is top with 21 inversions). 2014. Irish International Financial Services Centre tax-law firms sometimes list Pentair in their brochures as a Swiss tax inversion to Ireland; however Pentair was really a 2012 US tax inversion to Switzerland, who then used Ireland as a base for two years, before moving to the UK in 2016. While corporates who execute inversions downplay taxation in their rationale for the transaction, and instead emphasise strategic rationale, research is unanimous that tax was the driver for most US tax inversions from 1983 to 2016. The main objective of these transactions was tax savings, and they involved little to no shift in actual economic activity. —  Congressional Research Service (2019). One such strategy is a corporate inversion, which is executed to result in a significant reduction in worldwide tax payments for a company. Tax on US income. 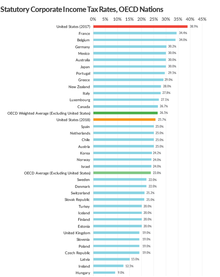 Before the 2017 TCJA, the US corporate tax rate was one of the highest rates in the developed world at 35%. The development of § Tools that could shift or earnings strip US-sourced profits to other jurisdictions without incurring US taxes, created an incentive for US corporates to execute tax inversions to lower tax jurisdictions. The "first wave" of US inversions from 1996–2004 focused on debt-based tools, however, the significantly larger "second wave" of US inversions from 2012–2016 also made use of IP-based BEPS tools. Tax on non-US income. Before the 2017 TCJA, the US corporate tax code applied the 35% rate of taxation to all worldwide corporate profits. 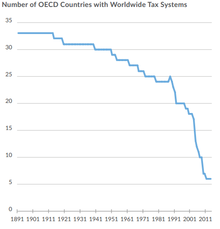 The US was one of only eight jurisdictions using a "worldwide tax system". All other jurisdictions used a "territorial tax system" where very low rates of taxation are applied to foreign-sourced profits (e.g. in Germany was at 5%). US tax academics noted this was the reason why non-US corporations made limited use of tax havens; in contrast, US corporations have been shown to be the largest global users of tax havens. Tax on offshore reserves. Tax academics have shown that the dominance of US corporations in using tax havens was driven by strategies to shield non-US income from US taxation. BEPS tools such as the "Double Irish" enabled US corporations to build up untaxed offshore cash reserves estimated at US$ 1–2 trillion in 2017. Ensuring that such reserves would be protected from any initiatives by Congress to subject them to US taxes required an inversion to another jurisdiction. Medtronic's US$20 billion in untaxed offshore reserves was noted as a driver for their 2015 inversion. In a 2015 presentation, the UK HMRC identified the same drivers of high corporate taxes and a "worldwide tax system" for the wave of UK tax inversions to Ireland in 2007–2010. By year three, the aggregate worldwide tax expense was 34% lower, while the US tax expense was 64% lower. A 2014 report by the Financial Times on US pharmaceutical tax inversions during 2012–2014, showed their aggregate worldwide tax rates dropped from 26–28% to 16–21%. 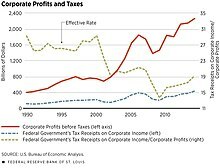 A similar 2014 study by Forbes Magazine using the projected post-inversion tax rates from the inverting corporates also confirmed the same movement in tax rates. A 2014 report by Reuters on 52 completed US tax inversions since 1983 showed that 19 outperformed the S&P500, another 19 underperformed the S&P500, another 10 were bought by rivals, another 3 went bankrupt and the final one returned to the US. Reuters concluded that: "But the analysis makes one thing clear: inversions, on their own, despite largely providing the tax savings that companies seek, are no guarantee of superior returns for investors". A 2017 study published in the Journal of Financial Economics, found that while inversions lowered the corporate tax and increased the economic value of the corporate, the after-tax benefits to shareholders were distributed disproportionately. CEOs and short-term shareholders, foreign shareholders, and tax-exempt shareholders benefitted disproportionately from inversions. However, long-term domestic shareholders did not benefit from inversions, since the US tax code requires taxable shareholders to recognize their capital gains at the time of the inversion. A 2019 study published in the International Review of Financial Analysis, found in the short-term, shares of inverting corporates increased in value. In the medium to longer-term, however, they found that the share price tended to decline. The driver was shown to be partly agency costs, and a distinction was drawn between the material gains of the CEO from the inversion and the losses of long-term shareholders. There were concerns on the acquisition premiums paid in inversion mergers, and that inversions tended to be favoured by corporates with poor growth outlooks. 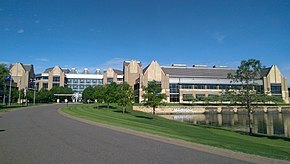 The effective headquarters of Medtronic in Fridley, Minnesota, United States. The post-inversion company has its tax residence outside of the US. In all definitions, the executive management (e.g. CEO, CFO), and the substantive offices and assets of the company, can remain in the US. For example, the executives of Medtronic, who executed the largest tax inversion in history by legally moving Medtronic to Ireland in 2015, remained in their main operational headquarters of Fridley, Minnesota in the US. All of Medtronic's substantive business and management operations still reside in the US. Substantial business presence. A US corporation creates a new foreign subsidiary, and exchanges each other's equity in proportion to their valuations so that after the exchange, the new entity is a foreign corporation with a US subsidiary. There is no "change of control". This is also called a "naked inversion", a "self-help inversion", a "pure inversion", or "redomiciling". Since the 2004 ACJA, and the 2012–16 Treasury rules, only US corporations with an existing "substantial business presence" in the foreign location that constitutes more than 25% of the post-inversion corporation (called the "expanded affiliate group" (EAG) in the legalisation) can execute a "self-inversion". This stopped US corporations inverting to smaller tax havens. US corporation acquired by a larger foreign corporation. A US corporation merges with a larger foreign corporation. The US shareholders, therefore, own a minority of the merged group and "effective control" moves outside of the US to the shareholders of the foreign corporation. The CBO does not recognize these transactions as being tax inversions (including where the acquiring corporation is a private equity fund, or the transaction is from a bankruptcy). A smaller foreign corporation acquired by a larger US corporation. A US corporation merges with a smaller foreign corporation who becomes the new legal parent of the group. The existing US shareholders still own a majority merged group this thus maintain "effective control", however, it is now a foreign company under the US tax code. The CBO considers these type of transactions as tax inversions. Since 2004 ACJA and 2012–16 Treasury rules, only mergers where the existing US shareholders own less than 80% of the EAG are recognized as foreign by the IRS (and mergers where the foreign-headquartered EAG is still over 80% owned by the original US corporate shareholders, is considered by the IRS to be a US corporation for taxation purposes). The material fall in the US aggregate "effective" corporate tax rate (1990 to 2016). Source: Federal Reserve Bank of St. Louis. In 2018, academics identified a new class of tax inversion as details of Apple's Q1 2015 leprechaun economics transaction in Ireland emerged. While Apple's tax residence remained in the US, Apple moved the legal tax residence of a large part of its business to Ireland in a US$300 billion quasi-tax inversion of its IP. The use of IP-based BEPS tools (e.g. Apple and Google's Double Irish and Microsoft's Single Malt), has been attributed as the driver for the reduction in the marginal aggregate effective US corporate tax rate, falling from circa 30% in 2000, to circa 20% by 2016 (see graphic). For example, the CAIA BEPS tool Apple used in 2015 would give Apple an "effective tax rate" of under 3% on the worldwide profits Apple generated on this IP that was shifted to Ireland. However, these IP assets had normally been housed in small Caribbean tax haven-type locations; Apple has been reported as using Bermuda and Jersey to house its IP. Such locations could never meet the 25% "substantive business test" of regulation T.D. 9592 for an inversion. However, Apple's 2015 BEPS transaction to Ireland was the first time a US corporation moved a substantial amount of IP to a full OECD jurisdiction where it already had a "substantive business operations". In July 2018, Seamus Coffey, Chairperson of the Irish Fiscal Advisory Council and author of the Irish State's 2016 review of the Irish Corporate Tax Code, posted that Ireland could see a "boom" in the onshoring of U.S. IP, via the CAIA BEPS tool, between now and 2020, when the Double Irish is fully closed. In February 2019, Brad Setser from the Council on Foreign Relations, wrote a New York Times article highlighting issues with TCJA in terms of combatting power of BEPS tools. In 2017, the Congressional Budgetary Office reported that of the 60 US tax inversions from 1983 to 2015 which the CBO officially recognize, over 40% cames from three industries: Pharmaceutical preparations (9), Fire, marine, and casualty insurance (7), and Oil & Gas Well Drilling and Servicing (7). The US Oil & Gas Well Drilling and Servicing and US Casualty Insurance inversions are mostly associated with the first wave of US tax inversions before 2004; the very first US tax inversion, McDermott International in 1983, was from the Oil & Gas Well Drilling and Servicing industry. These US companies that inverted in these two industries shared the common attributes of having mostly international client bases, and of having assets that were easily "portable" outside of the US. The assets of the Oil & Gas corporate tax inversions were already mostly held in securitization vehicles often legally located in offshore financial centres. Similarly, the assets of the Casualty Insurance corporate tax inversions were also mainly global reinsurance contracts that were also legally located in offshore financial centres. The US Life Sciences industry (Pharmaceutical and Medical Devices) became a significant part of the second wave of US tax inversions from 2012 to 2016. It also involved some of the largest and most public executed US tax inversions (e.g. Medtronic (2015) and Perrigo (2013)), as well as the aborted 2016 inversion of Pfizer and Allergan, which would have been largest inversion in history at US$ 160 billion. In July 2015, The Wall Street Journal reported that the circa 4% "effective tax rate" being paid by US pharmaceuticals who inverted to Ireland made them highly acquisitive of other US firms (i.e. they could afford to pay more to acquire US competitors and redomicile them to Ireland). The WSJ listed the extensive post-inversion acquisitions of Activis/Allergan, Endo, Mallinckrodt and Horizon. In August 2016, after the US Treasury blocked Pfizer's US$ 160 billion tax inversion to Ireland with Allergan, Bloomberg stated that "Big Pharma Murdered Tax Inversions". An important concept in inversions are the tools required to shift untaxed profits from the corporate's existing operating jurisdictions to the new destination. This is known as earnings stripping. Without these tools, a tax inversion might not deliver the expected tax savings, as the profits might arrive at the new destination having incurred full taxes in the jurisdictions in which they were sourced. For example, when Medtronic inverted to Ireland in 2015, over 60% of the merged group's revenue still came from the US healthcare system. Similarly, over 80% of Allergan's revenues comes from the US healthcare system post its Irish inversion. Medtronic and Allergan, therefore, could only avail of Ireland's lower effective tax rates if they could shift US-sourced profits to Ireland without incurring full US corporate taxes. Studies have shown that the earnings stripping of US-sourced earnings is a critical component of reducing the aggregate effective tax rate post the inversion (per § Evidence of tax savings). Debt-based tools. This is where the foreign parent of the newly inverted company raises debt to acquire the original US company. This debt is then "moved down" into the US subsidiary and the US profits are thus shifted untaxed to the foreign patent via interest payments on this debt. Early US tax inversions involved highly leveraged structures with real external debt. IP-based BEPS tools. [d] This is where the IP of the newly inverted group is moved to the lower-tax jurisdiction of the parent, who charges it out to the higher-tax jurisdictions in which the group operates (including its original US jurisdiction). This can only be achieved where the IP is already housed in an offshore location (e.g. Bermuda), so that its movement does not itself incur US tax charges. § Countermeasures created in the 2017 TCJA, directly targeted debt-based tools via the new BEAT tax, and introduce a competing US IP-based BEPS tool called the FDII tax. Major phases of US corporate tax inversions. Source: Congressional Research Service (2015). 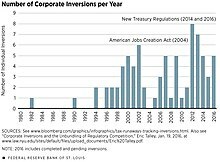 The US Congressional Budget Office and the Congressional Research Service have cataloged 85 US tax inversions since 1983 to 2017 (the CBO does not recognize all of them as official tax inversions). Bloomberg used this data to identify the most attractive destinations for US inversions titled Tracking the Tax Runaways which won the 2015 Pulitzer Prize for Explanatory Reporting, and was updated to 2018. The first wave of US tax inversions from 1996 to 2004 was mainly to Caribbean tax havens such as Bermuda and the Cayman Islands. These were mostly "naked inversions" where the company had little or no previous "substantial business activities" in the location. They also used debt-based earnings stripping tools to shift US profits to the new destination. The 2004 ACJA ended these types of "naked inversions" with IRS Section 7874. A significantly larger second wave of US tax inversions from 2012 to 2016 was mainly to the OECD tax havens of Ireland, and after their 2009 reforms, to the United Kingdom. These inversions involved mergers with real companies that met the "substantial business activities" test of IRS Section 7874. These destinations also had advanced IP-based BEPS tools (e.g. the Irish CAIA tool, the Double Irish tool, the UK Patent box tool) that could deliver an "effective tax rate" closer to zero on profits shifted to the destination. 4th Eaton (2012), and 6th Perrigo (2013). U.S. inversion in history, Liberty Global (2013). Canada 8 2016 Waste Connections Attracted the 5th–largest U.S. inversion in history, Burger King (2014). British Virgin Islands 1 2003 Michael Kors Ltd.
Panama 1 1983 McDermott International Attracted the first U.S. inversion in history, McDermott International (1983). A 2012 article in Tax Notes listed the 22 tax inversions of UK companies to other destinations from 2006 to 2010, until UK tax reform ceased further material inversions. While the full list is not available, the US Tax Foundation listed the nine most important UK inversions of which six went to Ireland (Experian plc, WPP plc, United Business Media plc, Henderson Group plc, Shire plc, and Charter International), and one each went to Switzerland (Informa), Luxembourg (Regus), and the Netherlands (Brit Insurance). No other jurisdictions have experienced a sufficiently material outflow of corporate tax inversions for their destinations to be worth chronicling. US inversions where the existing US shareholders owned more than 80% of the post-inversion group, or Expanded Affiliate Group (EAG), would not be recognized. Where the existing US shareholders owned between 60% but less than 80% of the EAG, the inversion would be recognized as a foreign company but with restricted tax benefits. Section 7876 included a "safe harbour" from its provisions where the EAG had an existing "substantive business presence" in the foreign country but left it to the Treasury to define what this meant. Shortly afterwards, the Treasury stated that to meet the "substantive business presence" the EAG had to have had over 10% of its employees, and assets, and income in the foreign location. In 2012, the Treasury issued regulation T.D. 9592 that increased the threshold for the "substantive business presence" safe harbour exemption from Section 7876, from 10% to 25%. In 2014, the Treasury issued tax notice 2014–52 that blocked various legal structuring techniques to circumvent the earlier ACJA and TD 9592 regulations; AbbVie and Chiquita cancel inversions. In 2106, the Treasury issued a series of rulings to clarify past rulings, and introduce new provisions that blocked additional legal structuring techniques to circumvent the ACJA. In 2016, two days after the final Treasury ruling in 2016, Pfizer announced that it was aborting its planned US$ 160 billion tax inversion to Ireland via a merger with Allergan plc. Reduction in the headline US corporate tax rate from 35% to 21%. Transformation of the US corporate tax code from a "worldwide tax system" to a hybrid-"territorial tax system". Specific anti-US earnings stripping provisions such as the BEAT tax. New US IP-based BEPS tools such as the 13.125% FDII tax rate. —  Jami Rubin, Managing Director and Head of Life Sciences Research Group, Goldman Sachs (March 2018). In a report to Congress in March 2019, the Congressional Research Service noted that "there are also indications that most tax motivated inversions had already been discouraged by the 2016 regulations" and that with the addition of the since the 2017 TCJA that "Some firms appear to be considering reversing their headquarters [or past inversion] decision". Reduction in the headline US corporate tax rate from 28% to 20% (and eventually to 19%). Transformation of the UK corporate tax code from a "worldwide tax system" to a "territorial tax system". Creation of new IP-based BEPS tools including a low-tax Patent box. In 2014, The Wall Street Journal reported that "In U.S. tax inversion Deals, U.K. is now a winner". In a 2015 presentation, the UK HMRC showed that many of the outstanding UK inversions from 2007–10 period had returned to the UK as a result of the tax reforms (most of the rest had entered into subsequent transactions and could not return, including Shire). 1982 McDermott International to Panama, first-ever tax inversion, and first ever "naked inversion"; only ever US tax inversion to Panama. 1994 Helen of Troy to Bermuda, second-ever tax inversion and "naked inversion". 1997 Tyco International to Bermuda; Tyco would later spin-off Covidien who would execute the largest inversion in history with Medtronic in 2015; Tyco itself would merge with Johnson Controls in 2016 in the 3rd largest inversion in history. 1998 Fruit of the Loom to the Cayman Islands; entered into bankruptcy 3 years later and was bought by Berkshire Hathaway. 1999 Transocean to the Cayman Islands. 2001 Ingersoll Rand to Bermuda. 2001 Accenture to Bermuda, would later "self-invert" to Ireland in 2009 to become Ireland's first inversion and first Irish CAIA BEPS tool user. 2003 Michael Kors to the British Virgin Islands, only ever US inversion to the BVI. 2009 EnscoRowan to the United Kingdom, first US inversion to the UK. 2012 Eaton Corporation to Ireland with a $US12 billion merger with Cooper Industries, 4th largest inversion in history. 2013 Liberty Global to the United Kingdom with a US$23 billion merger with Virgin Media, 2nd largest inversion in history. 2014 Burger King to Canada with a US$12 billion merger with Tim Hortons, 5th largest inversion in history. 2015 Medtronic to Ireland with a US$48 billion merger with Covidien plc, largest inversion in history. 2015 Mylan to the Netherlands. 2016 Johnson Controls to Ireland with a US$17 billion merger with Tyco International, 3rd largest inversion in history. 2014 Abbvie to Ireland with a US$54 billion merger with Shire plc, would have been the 2nd largest inversion in history; blocked by US Treasury. 2014 Walgreens to the United Kingdom, as it had already merged with UK-based Alliance Boots; decided to maintain its legal headquarters in the US. 2014 Pfizer to the United Kingdom with a US$120 billion merger with Astra Zeneca, would have been the largest inversion in history; Astra wanted a higher premium. 2016 Pfizer to Ireland with a US$160 billion merger with Allergan, would have been the largest inversion in history; blocked by US Treasury. 2006 Experian plc to Ireland with a "self-inversion", first ever UK inversion to Ireland. 2008 WPP plc to Ireland, would later return to the UK. 2009 Shire plc to Ireland, would later merge with Takeda Pharmaceuticals in 2018. ^ a b While some research lists the date of the McDermott International inversion as 1982, the Congressional Budget Office officially record its date as 1983. ^ By merging, the expanded Allergan group would meet the "substantial business activities" of 25% in a planned future tax inversion with Pfizer; however, in 2016 the US Treasury would block Pfizer's proposed tax inversion with the expanded Allergan group by changing the rules to disallow transactions executed in the previous 3 years when applyig the "substantial business activities" test. In some tables, the 2015 US$70 billion Activis Allergan merger is classed as a tax inversion (the largest in history), however both coporates were already Irish corporates at the time they merged and thus their merger was not an official tax inversion. ^ Shire's proposed 2014 corporate tax inversion with U.S. pharmaceutical AbbVie Inc. failed due to the 2016 Obama Administration anti-inversion rules. In 2018, Shire agreed to a lower $64 billion bid from Japanese pharmaceutical Takeda, who confirmed they would not be executing a tax inversion to Ireland (Japan's headline corporate tax rate is 35%), which was attributed to the fact that Japan, like the UK, switched to a "territorial tax" system in 2009. ^ Some "league tables" of largest ever tax inversions include Activis/Allergan, however both Activis and Allergan were already Irish companies when the merged, and thus it was not a tax inversion. ^ a b Zachary Mider (18 December 2014). "McDermott International: The Greatest Tax Story Ever Told". Bloomberg News. Retrieved 15 April 2019. ^ a b Phillip Fuller; Henry Thomas (May 2017). "TAX INVERSIONS: The Good the Bad and the Ugly" (PDF). Jackson State University. SSRN 2973473. Retrieved 14 April 2019. ^ Rob Wile (July 2014). "Treasury Secretary Jack Lew Warns Tax Inversions Are Increasing At 'Breakneck Speed'". Business Insider. Retrieved 14 April 2019. ^ a b c d Bray, Chad (6 April 2016). "Pfizer and Allergan Call Off Merger After Tax-Rule Changes". The New York Times. Retrieved 15 April 2019. ^ a b c d e f g Jonathan D. Rockoff; Nina Trentmann (11 February 2018). "New Tax Law Haunts Inversion Deals". Wall Street Journal. ^ Carolyn Y. Johnson (18 September 2017). "Tax-avoiding mergers allowed U.S. companies to lower their initial tax bill by $45 million, CBO says". Washington Post. Retrieved 21 April 2019. If current policy does not change, the agency projects future tax-avoiding deals will reduce tax receipts from corporations by 2.5 percent in 2027 — or $12 billion. ^ a b c d e f Kyle Pomerleau (13 March 2018). "Inversions under the new tax law". Tax Foundation. Retrieved 15 April 2019. ^ a b c d e f g William McBride (14 October 2014). "Tax Reform in the UK Reversed the Tide of Corporate Tax Inversions". Tax Foundation. Retrieved 14 April 2019. ^ a b c d Danielle Douglas-Gabriel (6 August 2014). "These are the companies abandoning the U.S. to dodge taxes". The Washington Post. ^ a b c d e f g h Emily Stewart (22 July 2017). "As Treasury Moves to Bring Back Inversions, Here are 7 of the Biggest Recent Deals". TheStreet. ^ a b Tom Fairless; Shayndi Raice. "In U.S. tax inversion Deals, U.K. is now a winner". "Right now, it's safe to say that the U.K. is the preferred country of destination for inverted companies, given the favorable tax regime and the non-tax attractions of the U.K.," said Mr. Willens, a former managing director at Lehman Brothers. ^ Dee DePass (1 July 2014). "Before Medtronic's deal, Pentair relocated twice to save on taxes". Star Tribune. And in 2012, the water technology company Pentair merged with Tyco Flow Control and "re-domiciled" its corporation from Golden Valley to Switzerland. That merger — accomplished through a tax-free "Reverse Morris Trust" — lowered Pentair's corporate tax rate from 29 to 24.6 percent. Determined to save even more, Pentair relocated again on June 3 from its Swiss headquarters to Ireland, which has a tax rate of roughly 12.5 percent. ^ Joe Brennan (16 August 2016). "Irish-based industrial firm Pentair in $3.15bn deal". The Irish Times. ^ Julia Kollewe (8 March 2018). "Adderall maker Shire agrees to £46bn takeover by Takeda". The Guardian. ^ Ben Martin (26 April 2018). "Shire willing to back $64 billion Takeda bid, market signals doubts". Reuters. ^ a b Editorial Board (6 April 2016). "A Corporate Tax Dodge Gets Harder". The New York Times. Retrieved 15 April 2019. But even as it rushed to complete the biggest tax-avoidance deal in the history of corporate America, it continued to promote the strategic and economic benefits of the merger. Any pretense to a motivation other than dodging taxes has now been wiped away. ^ a b c "CORPORATE INVERSIONS: A POLICY PRIMER". Wharton University. 24 October 2016. Retrieved 21 April 2019. ^ a b "Options for Taxing U.S. Multinational Corporations" (PDF). Congressional Budget Office. January 2013. Retrieved 15 April 2019. ^ Gabriel Zucman; Thomas Wright (September 2018). "THE EXORBITANT TAX PRIVILEGE" (PDF). National Bureau of Economic Research: 11. ^ a b Vanessa Houlder; Vincent Boland; James Politi (29 April 2014). "Tax avoidance: The Irish inversion". Financial Times. Retrieved 14 April 2019. Dozens of US multinationals have moved their tax base outside the country to escape the high tax rate, global reach and perverse incentives of a system that has encouraged companies to build up a $1tn cash pile trapped overseas. ^ a b Kevin Drawbaugh (18 August 2014). "REUTERS INSIGHT: When companies flee US tax system, investors often don't reap big returns". Reuters. Retrieved 15 April 2019. ^ Brent Glover; Oliver Levine (25 May 2016). "Are Corporate Inversions Good for Shareholders?". Columbia Law School. Retrieved 15 April 2019. ^ Brent Glover; Oliver Levine; Anton Babkin (April 2016). "Are Corporate Inversions Good for Shareholders?". Journal of Financial Economics. 126: 227–251. Retrieved 15 April 2019. ^ Elaine Laing; Constantin Gurdgiev; Robert B. Durand; Boris Boermans (10 April 2019). "How U.S. Tax Inversions Affect Shareholder Wealth". Columbia Law School. Retrieved 15 April 2019. ^ Elaine Laing; Constantin Gurdgiev; Robert B. Durand; Boris Boermans (April 2016). "U.S. tax inversions and shareholder wealth effects". International Review of Financial Analysis. 62: 35–52. Retrieved 15 April 2019. ^ Zachary R. Mider (5 May 2014). "Here's How American CEOs Flee Taxes While Staying in U.S." Bloomberg News. ^ Renae Merie (9 September 2016). "Medtronic, now based in Ireland, still reaps U.S. benefits". Star Tribune. Since its "inversion," the company has been awarded more than $40 million in federal contracts and its executives still work at its Fridley campus. ^ a b Brad Setser (25 April 2018). "Tax Avoidance and the Irish Balance of Payments". Council on Foreign Relations. Retrieved 15 April 2019. ^ Brad Setser (30 October 2017). "Apple's Exports Aren't Missing: They Are in Ireland". Council on Foreign Relations. Retrieved 15 April 2019. ^ Lynnley Browning; David Kocieniewski (1 September 2016). "Pinning Down Apple's Alleged 0.005% Tax Rate In Ireland Is Nearly Impossible". Bloomberg News. Retrieved 15 April 2015. ^ Jesse Drucker; Simon Bowers (6 November 2017). "After a Tax Crackdown, Apple Found a New Shelter for Its Profits". New York Times. ^ Seamus Coffey, Irish Fiscal Advisory Council (18 July 2018). "When can we expect the next wave of IP onshoring?". Economics Incentives, University College Cork. IP onshoring is something we should be expecting to see much more of as we move towards the end of the decade. Buckle up! ^ Liz Hoffman (7 July 2015). "The Tax Inversion Wave Keeps Rolling". The Wall Street Journal. Horizon and other inverted companies are using their new, lower tax rates to turbocharge corporate takeovers. Applying those rates, often in the midteens, to profits of companies in the US, with a federal corporate rate of 35%, can yield extra savings on top of those traditionally wrung from mergers. Moreover, unlike the US, Ireland and most other countries, only tax profits earned in-country, giving companies the freedom and incentive to shift income to still-lower-tax jurisdictions. ^ Max Nisen (6 August 2016). "Big Pharma Murdered Tax Inversions". Bloomberg News. Retrieved 15 April 2019. ^ a b "Inverse logic". The Economist. Washington, D.C. 20 September 2014. Retrieved 14 April 2019. Often, the group can shift debt to the American unit, or have it borrow from the foreign parent. It can then pay interest to the parent while deducting the sums involved from its American taxes. Several studies have found such “earnings stripping” common when companies invert. ^ a b Jim A. Seida; William F. Wempe (December 2004). "Effective Tax Rate Changes and Earnings Stripping Following Corporate Inversion" (PDF). National Tax Journal. LVII (4). Retrieved 15 April 2019. [..] we infer that inversion–related ETR reductions are due to U.S. earnings stripping. ^ William McBride (14 October 2014). "Tax Reform in the UK Reversed the Tide of Corporate Tax Inversions". Tax Foundation. ^ Editorial (14 November 2012). "The United Kingdom's Move to Territorial Taxation". Tax Foundation. Retrieved 15 April 2019. From 2007 to 2010, a total of 22 companies inverted out of the UK. See Martin A. Sullivan, Eaton Migrates to Ireland: Will the U.S. Now Go Territorial?, 135 Tax Notes 1303 (June 11, 2012). ^ "How to stop the inversion perversion". The Economist. 26 July 2014. Retrieved 15 April 2019. ^ Kyle Pomerleau (3 May 2018). "A Hybrid Approach: The Treatment of Foreign Profits under the Tax Cuts and Jobs Act". Tax Foundation. Retrieved 15 April 2019. While lawmakers generally refer to the new system as a “territorial” tax system, it is more appropriately described as a hybrid system. ^ Amanda Athanasiou (19 March 2018). "U.S. Tax Cuts and Jobs Act: Corporate tax reform - Winners and Losers". Taxnotes International. p. 1235. ^ Athanasiou, Amanda (19 March 2018). "U.S. Tax Cuts and Jobs Act: Corporate tax reform - Winners and Losers". Taxnotes International. pp. 1235–1237. The new tax code addresses the historical competitive disadvantage of U.S.–based multinationals in terms of tax rates and international access to capital, and helps level the playing field for U.S. companies, Pfizer CEO Ian Read. ^ Howard Gleckman (26 January 2016). "How Much Revenue The U.S. Is Losing Through Tax Inversions, And How Much Worse It May Get". Forbes Magazine. Retrieved 21 April 2019. ^ Levine, Matt (25 August 2014). "Burger King May Move to Canada for the Donuts". Bloomberg News. Retrieved 15 April 2019. ^ Katie Allen (15 April 2008). "Drugs company moves to cut tax bill". The Guardian. Retrieved 15 April 2019. Marples, Donald J.; Gravelle, Jane G. (2019). Corporate Expatriation, Inversions, and Mergers: Tax Issues (PDF) (Report). Congressional Research Service. Marples, Donald J.; Gravelle, Jane G. (2018). Issues in International Corporate Taxation: The 2017 Revision (P.L. 115-97) (PDF) (Report). Congressional Research Service. Mider, Zachary (2017). Tracking the Tax Runaways (Report). Bloomberg News. Hall, Keith (2017). An Analysis of Corporate Tax Inversions (PDF) (Report). Congressional Budget Office. Neely, Michelle C.; Sherrer, Larry D. (2017). "A look at Corporate Tax Inversions: Inside and Out" (PDF). The Regional Economist. Federal Reserve Bank of St. Louis. Lunder, Erika K. (2016). Corporate Inversions: Frequently Asked Legal Questions (PDF) (Report). Congressional Research Service. Marples, Donald J.; Gravelle, Jane G. (2014). Corporate Expatriation, Inversions, and Mergers: Tax Issues (PDF) (Report). Congressional Research Service. McBride, Will (2014). Tax Reform in the UK Reversed the Tide of Corporate Tax Inversions (PDF) (Report). Tax Foundation.